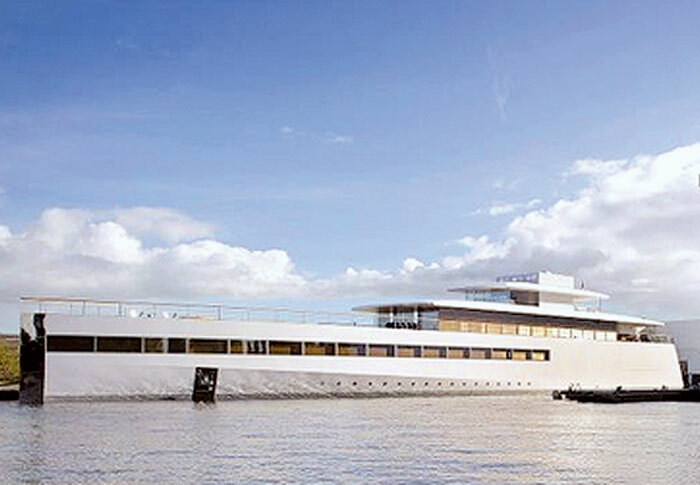 AMSTERDAM — The sleek, white superyacht Apple founder Steve Jobs commissioned before his death can finally leave the Netherlands and be delivered to his family in California, following the resolution of a payment dispute with the yacht’s designer. Jobs collaborated on designing the 256-foot all-aluminum Venus, which has a minimalist aesthetic, with French product designer Philippe Starck. Dutch newspaper Het Financieele Dagblad reported Dec. 21 that Starck had hired a debt collection agency and got a summary legal order to keep the boat from leaving. Port of Amsterdam spokesman Jeroen Ranzijn confirmed the boat had been in the harbor since Dec. 8, and said it would not leave until the civil dispute was resolved. “It was actually ready to continue its voyage when there was a dispute between two parties — including the heirs, and one party who laid a claim on the boat,” Ranzijn said. According to the newspaper, Starck had been paid $7.9 million by Jobs’ heirs, but he believed he was owed $11.9 million. The boat reportedly cost $138.6 million to build, at Feadship Royal Dutch Shipyards. The amount of the settlement with Starck was not disclosed, but port authorities said the boat is now free to leave Amsterdam. — Associated Press and The Log staff reports were used in this story.